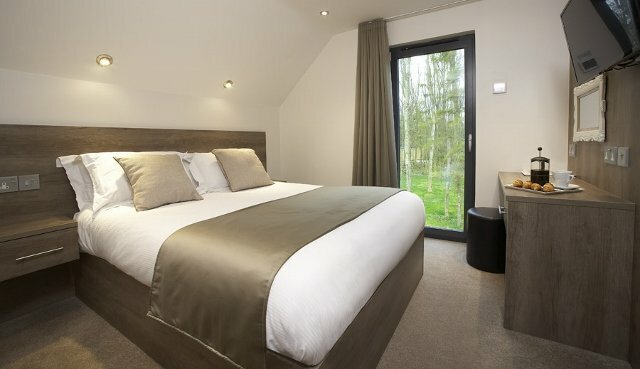 Set in 180 acres of glorious countryside and with its own championship golf course, The KP is an idyllic retreat in heart of the Yorkshire Wolds, the landscape made famous by renowned artist David Hockney. 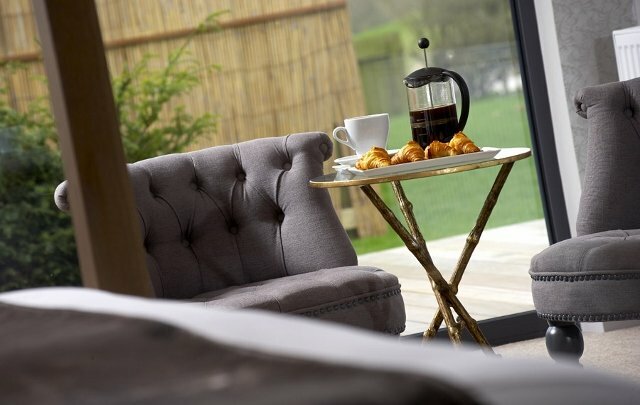 Accommodation is offered in self-contained woodland lodges boasting all the luxurious finishing touches of a boutique hotel, affording guests peace, quiet and privacy in a picturesque rural setting. 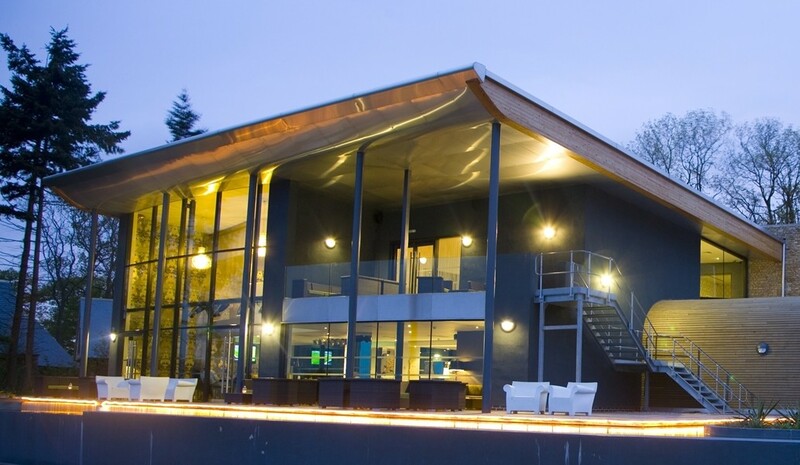 Visitors also benefit from the wonderful facilities on site, which include the elegant Glasshouse restaurant where tempting menus are created using the finest locally-sourced ingredients. If you’d like to get out and explore the surrounding countryside, you can hire bikes or let the kids burn off some energy in the play area. A choice of pampering treatments is also available. If you can tear yourself away, you have the Yorkshire Wolds, the East Coast, the North Yorkshire Moors and the historic city of York on your doorstep just waiting to be explored. 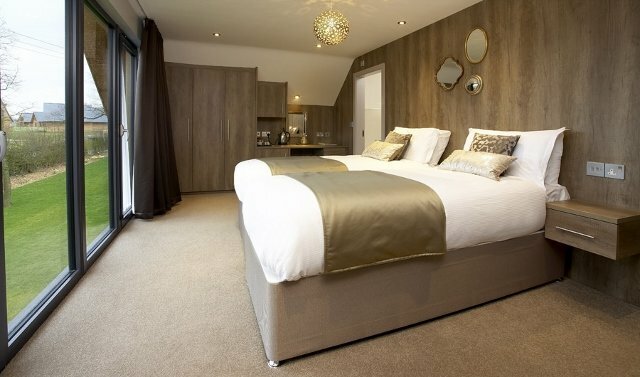 Choose from a stylish twin or double room or suite – complete with a glamorous four-poster if you’d like one! 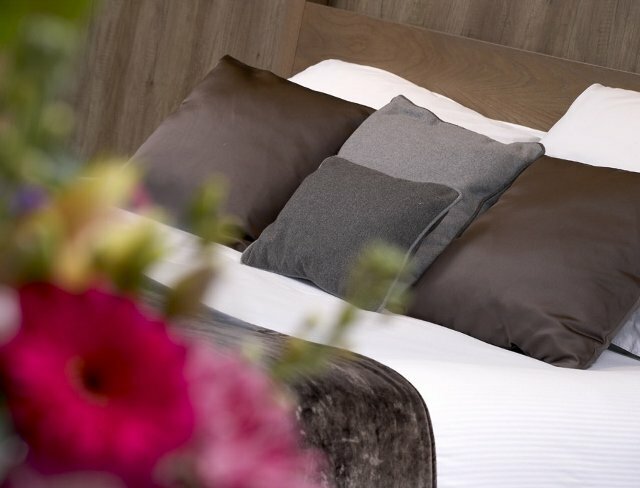 Available on a room only, bed and breakfast or dinner bed and breakfast basis, the rooms are located within lodges to give the same feeling of luxury and privacy. 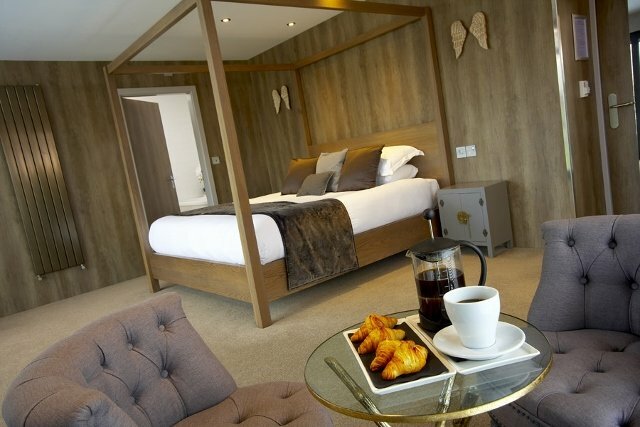 All of the guest accommodation is decorated and furnished in a sleek ultra-modern style. 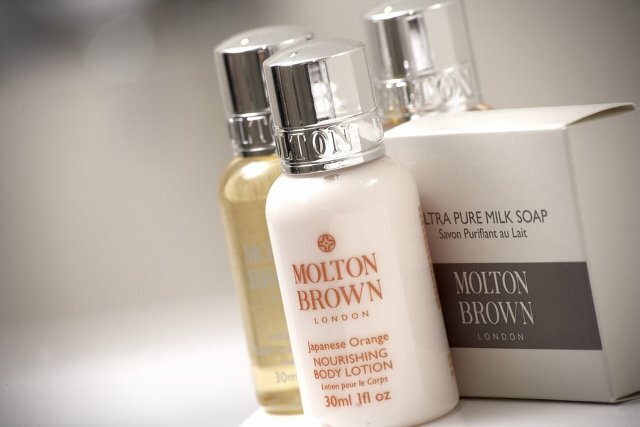 Each room has a smart white en suite bath and/or shower room with divine Molton Brown toiletries. 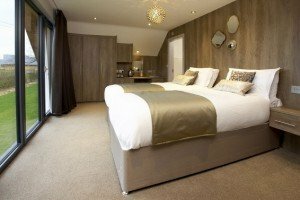 Prices start at £65 per night for a double or twin room, £85 for a super king sized suite or £105 for a four poster room with hot tub. 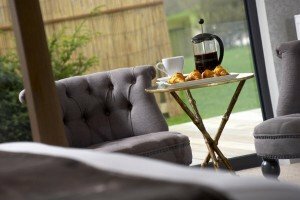 For breakfast head to The Glasshouse restaurant, where you can enjoy your choice of a buffet of cereals, juices, pastries, fresh fruit, yoghurt and berries, and more, followed by the cooked breakfast of your choice. Options include a full Yorkshire breakfast, Eggs Benedict or porridge. 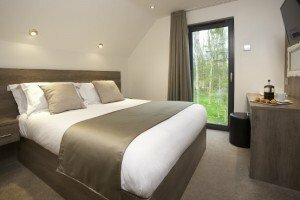 The Glasshouse overlooks the 18-hole golf course and out towards the countryside beyond. The outdoor terrace, complete with water feature, is a relaxing place to enjoy great food and drink with family and friends. Everything from a light lunch to a sumptuous rib of beef for Sunday lunch is on offer. The KP makes a stunning venue for weddings and other special occasions. The helpful team are always happy to tailor events to your exact requirements. You have found a wonderful place to stay and Boutique and Breakfast is committed to giving you a personalised service so that you can find the right room at the right price. 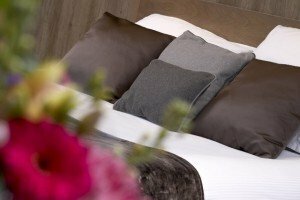 Simply fill in our enquiry form and within 24 hours you will receive a response from The KP Rooms & Suites tailored to your needs. This will be in the form of either a telephone call or an email. 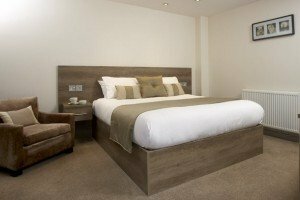 The room was beautiful and comfortable, and the bathroom large and spotless. 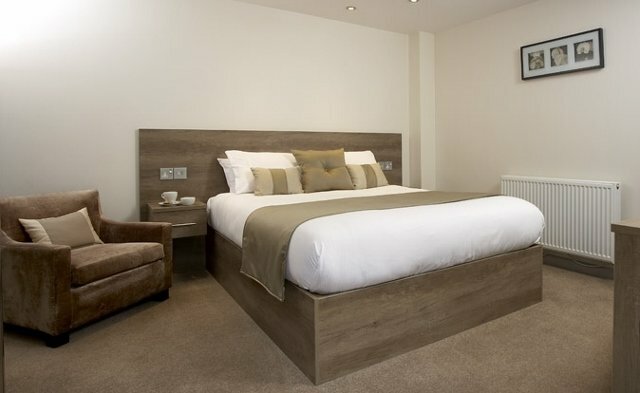 I would recommend for anyone that wants a posh golf break!